Just got back from Captaincon and man oh man was it fun. So I’ve been grinding out Skorne games as much as possible and I think im starting to figure them out. But that will be for another article. I picked up Xerxies 2 their and man is that a fun warlock to play. I pretty much only played Xerxies 2 their and while I lost about 1/3 of my games with him he has been the most fun I have had since I first started playing Warmachine and Hordes. Next up on the docket of casters to play are Morgul 1 and Rasheth. Though I’ll probably just end up pairing Xerxies 2 and Morgul 1 for a while. So I’ve been giving Karax some thoughts in trying to get the most out of theme without playing Zaadesh 2. After some look through, I feel Xerxis 1 has some game to get the Karax to seem ridicules. The idea behind the list is to be a walking brick of Skorne shenanigans. The Karax are the front line ready to whether the storm of attacks by getting up to Def 16 against ranged attacks and Arm 21(Defenders ward along with Shield Wall). Also the unit being effectively Def 16 (Defenders Ward + Set Defense), plus star-crossed from Wrong Eye, and Arm 23(Defenders Ward +Shield Wall+ Gnawing Pain) against Melee. Also don’t forget tough from the Willbreaker. All this makes the unit pretty hard to remove even with out the Karax Officer and Standards Mini Feat for a +3 Arm. If things even go perfectly, your looking at De16, Arm 27, Star-Crossed Karax after they hit their target at pow 12 weapon master under Xerxis 1’s Feat. While this all makes the Karax a pain in the rear end the list isn’t done yet. The Agonizer and Krea help keep Tiberion and the Gladiator around while Rush from the Gladiator gets Tiberion stuck in their. Also Reposition 3″ on Tiberion just seems a little silly also. ^_^ Also taking two Catapult Crew’s allows you to damage your opponents heavies before the clash or to clear out infantry with their massive 4″ aoe’s. Pow 8 blast damage should be able to clear out some of the light infantry attempting to jam about. Now the list does have some issues and mainly that it can move pretty slowly across the board. So if you want to have your Karax and the shenanigans they are only really moving 8″ a turn. You could also sacrifice Defenders Ward on them for Tactical Supremacy giving them Repostion 3″. So the Shield Wall walk 8″ then Reposition 3″ for a total of an 11″ move. Also Xerxis is Fury 5 and your not going to be really slinging spells to much with him. In fact he really just sits around and attempts to not to die maybe occasionally attacking something. Also since he is Fury 5 the Beast Handlers are going to be a real linchpin in the list. Though with the Errata looming in just over a month and a half I guess theorizing this list is kind of useless. Oh well…. So I’ve been slightly down on my Makeda 3 list but that’s only because she isn’t solving the problems Mordikaar can’t deal with. So I’ve decided to give Makeda 1 a run. This list is still very assassination based with Molik Karn possible threatening 17″ off of one side step at POW 15 weapon master and MAT 9 will kill casters. Not only that though Gladiator and Tiberion can not only get work done but have a decent threat range to boot. My favorite part though is the Scarab Pack package. So with them and their animus your looking at DEF 15 + 2 (from Quicken) +2 (from force Aura from the Basilisk Krea) maxing out at DEF 19 if their isn’t a hill to stack this all on. Not only that but Makeda gets to be DEF17 and has her battlegroup all shield guards. I will admit I am uncertain about how big her battlegroup is but I think their will be too much meat for my enemy to chew through before getting to the enemy warnoun. Now I got to try Makeda 1 at my LGS where we had 18 players. I ended the day 2-2 which I felt comfortable with overall. While my Makeda 1 list performed as planned I’m not convinced its what I want in a second list. 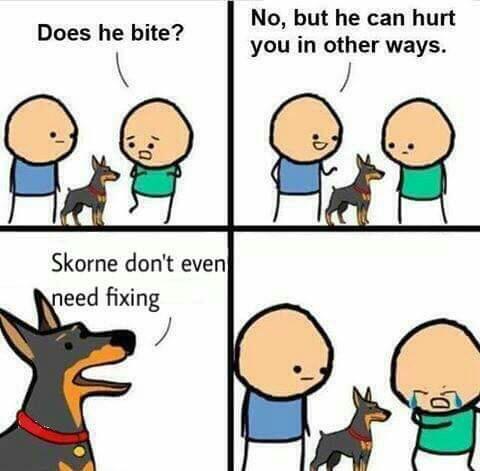 Well I’ve caught the Skorn bug now and for the past two months I have been trying to build up two Skorn lists to play for at minimum of six months. I’ve settled on Mordikaar and Makeda 3 for my list pairing. Now while I do not have enough play testing for the Mordikaar list yet I did manage to head out to a small steamroller at another game store I have never been to. I figured it would be a good way to get used to Skorn or learn how to play Skorn. I haven’t played any test games yet. The Steamroller was three rounds five players total. I dropped Mordikaar in rounds two and three. Specifically into Krueger 1 and Doomie 2. The Krueger 1 match up was pretty tough and seemed like a bad match up for me. I manage to attrition quite awhile and then my opponent clocks himself. Round three top table (I had the bye round one). I play into Doomie 2. If I was smarter I probably would have had Mordikaar in my zone so I could score turn two but lucking out and having my gladiator survive a mauler I mange to score three control points turn three. Dominate friendly zone, control enemy zone, and destroy enemy objective. He comes in starts contesting everything but fails to clear his zone putting Doomie 2 in the open with only one transfer. I have a Bloodrunner ping Doomie 2 for one damage then my void spirit who has been going all Rambo like, this game. Decides he needs to one shot Doomie 2 hitting him for 18 damage. Which he transfers to a bomber. G37 R3K7! Despoiler then charges in and finishes him off. Mordikaar is so much fun to play. The only thing I am unsure about is if doing a Top of Turn 1 feat is really worth it but I think it tilted both my opponents early on in the game to really be able to jam into them. Also despoiler and gladiator are awesome. Void spirits are amaze-balls if you don’t get them killed early on and I need to read what the Soulward does since all he did was sit in the back running around not sure what to do. My Makeda 3 list really needs some testing but I am pretty confident in the list. Lets talk about terrain. To many times have I seen players claim they use enough terrain. To many times have I seen players claim their board is even or fair. To many times I have seen players just shove the terrain into areas so that the terrain is nothing more than a decoration that shouldn’t be touched. Serously people get your head out of your rear ends. This article is going to, well obviously be geard towards warmachine and hordes, but the guidelines here can be applyed to any tabletop wargame. 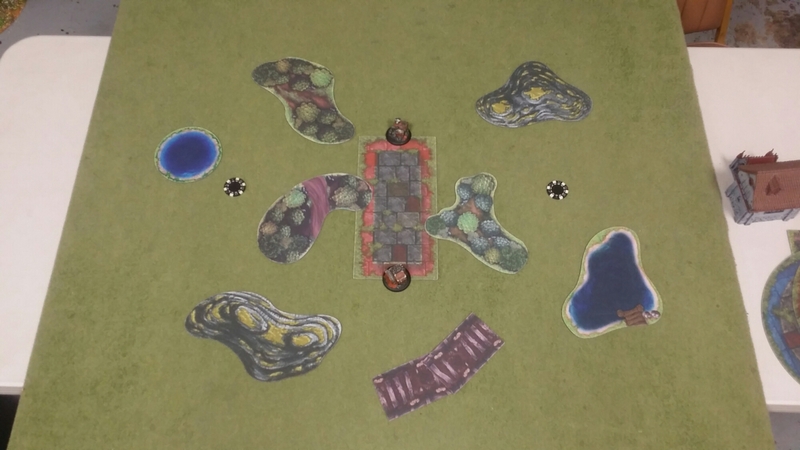 As a general rule, an average table should have six to eight pieces of terrain placed closely enough to eliminate large open areas without unduly constricting movement. The size of terrain pieces is also important. No piece should be insignificantly small or extremely large; pieces from 3˝ to 6˝ in length and width are best. Terrain pieces are categorized as restricted or unrestricted for the purposes of setting up tables. • Restricted terrain: hazards, obstructions, obstacles. We recommend that the majority of terrain on a table is unrestricted terrain. The exact number, type, and placement of terrain pieces are up to the EO, but the following terrain rules must be followed when setting up tables. • Do not place terrain within 6˝ of any table edge. • Unrestricted terrain pieces cannot be placed within 2˝ of any other terrain piece. Trenches, however, can be placed in contact with other trenches. • Restricted terrain cannot be placed within deployment zones or within 5˝ of any other restricted terrain piece. • When placing restricted terrain within scenario zones or near flags and objectives, the EO must take care to not accidently block off important sections of the battlefield from models with huge bases (e.g., an obstacle within 3˝ of a flag would be acceptable, but placing additional obstructions or obstacles around that flag that prevent a huge base from interacting with the flag would not be acceptable). These rules apply only to initial terrain setup by the EO and do not apply to terrain placed by players before or during the game due to special rules in their army. I personally beleave the Steamroller 2016 has some of the best terrain placement rules so far. The rules as written above which were pulled straight out of the steamroller 2016 pdf packet encourges terrain towards the middle where the engagment area will be the heaviest. Here we can see a simple layout that abides by the steamroller 2016 packet using one of my favorite scenarios.Recon. 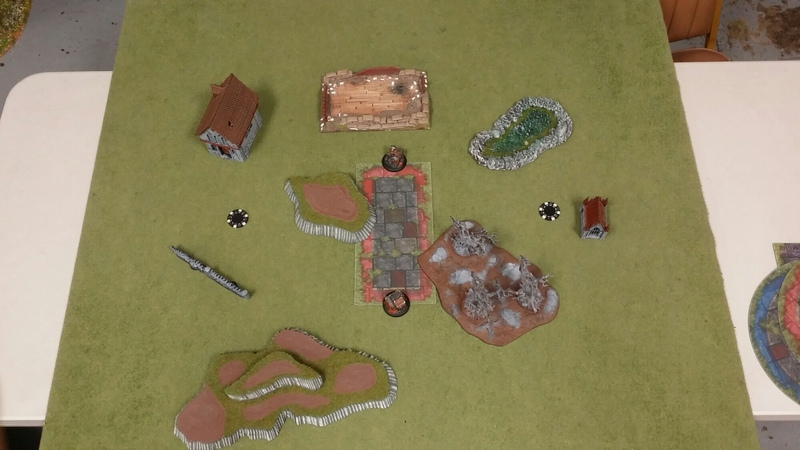 There are eight pieces of terrain, with no obstructions in the zone or preventing any model from going base to base with the flags or objectives. There is a nice verity of terrain granting elivation bonuses, cover, concealment, and Line of Sight blocking terrain. I love flat terrain. I have nothing against it. I love how portable it is. I love the ease of use and the fact models will stand on it. Personally I think if you are going to use flat terrain shoot for the printed flat terrain but if you cant then simple color felt works just as good. As long as they are labled in a way for players to eaisly identify what they are. Even this layout follows the steamroller 2016 guidlines. Elivation, cover, rough terrain, and Line of Sight blocking terrain are in such a way that a player needs to think about what side he wants vs going first or second. 1. Not every game store has a plethora of terrain a gamer can use in his battles for glory, but that shouldn’t stop players from having an awsome table to play on. You may have to go that extra mile and make some terrain. The other option is buying already made terrain to ether donate or to bring with you to game night. Heck if you can papercraft the hell out of terrain do it! I wanna see that now. 2. If you got a weird piece of terrain that falls under none of the hard rules written, don’t be afraid to make up rules or just steal rules from another piece. Got a strange looking obilisk? Treat as a obsturction or if it is low enough a simple obstacle. Got a destroyed warjack in a forest looking piece? Treat as forest that provides cover instead of concealment. Dont be afraid to make up rules for a custom pieces of terrain. As long as you and your opponent agree that the rules are fair. More Madrak 2 Musing, and Thoughts beyond. So I have been playing nothing but Madrak 2 since Mk3 came. Now while I have been having nothing but fun with him I am feeling some slight issues with my list. My problem? Well I just keep losing on scenario. Especially if there is a flag that my opponent can dominate for one on his side. I don’t know if its the list or just me (to be fair I dont play for scenario usually I prefer assasinations). When played right though the list is just super durable and punchy. I mean over two turns I had Rok eat Behemoth and two other Khador Heavies; just walking up like it was nothing. With space for three more attacks. Rok is amazing especially when you put Rage in him. I think its time to look into a second list to pair with Madrak 2. Hello Gunnbjorn! Trollblood – Would you like to know more? Yea six years of melee only, it’s about time to be running a gun line. I hope to test the list out on a week or two; I am unsure if it will solve for Khador cloud wall. Hunters Grimm is a better choice for tooling against cloud wall and is also on the docket for testing. I’ve been messing around with Madrak Ironhide, The World Ender, and it has been nothing but fun times. I’ve never played a butcher like caster before but the list feels in a funny way Cryx like. While I have been fine tunning the list and still need more games this is where I ended up. This is where I am at now with Madrak 2. Saxon Orrik helps where pathfinder is needed with the Razorback Crew whose whole goal is to harass the zone. Breylin is really just a 5pt flex spot and can be easily switched for something else as needed, otherwise she is a solo hunter. The Fell Caller Hero is an amazing tool in Trolls so far. Pathfinder, +2 to MAT, and the ability to stand those who are knockdowned makes a great tool piece. Plus he’s no slouch when it comes to getting work done. As for specialist I originally wanted the Bushwhackers(min unit) with the Command Attachment but the Bouncer works better for protecting Madrak against pop and drop tactics. The Pummeler Crew might seem redundant with the Razorback Crew but really they are their incase of infantry spam. Though with 5pts left they can be switched for something more meta specific. You may notice that I am not running the Krielstone and Attachments. After playing 4ish games with them I have become unhappy with them in this list. Now im not saying that they are bad but I feel that whith how aggressive I plan on playing Madrak 2 the stone serves no purpose. After taking them out the next two games I played the list felt totally diffrent. It felt lighter, faster, more finesse like. Which is more my play style. As for a second list I have some ideas but nothing concrete. My second list is usually meta dependent and with no idea what the meta looks like its hard to say. Currently I am looking at Gunbjorin, Grim 2, and Jarl.